A high available application Solution is designed to be compliant with web standards, which recommends minimum three tier servers and three network zones for enterprise standard secure applications. The first tier, presentation layer, provides an interface to the user for user interaction, and secure access (https). This layer is implemented by http servers. The http servers host all the static data providing certificates for secure network access and direct the user requests to web application server. 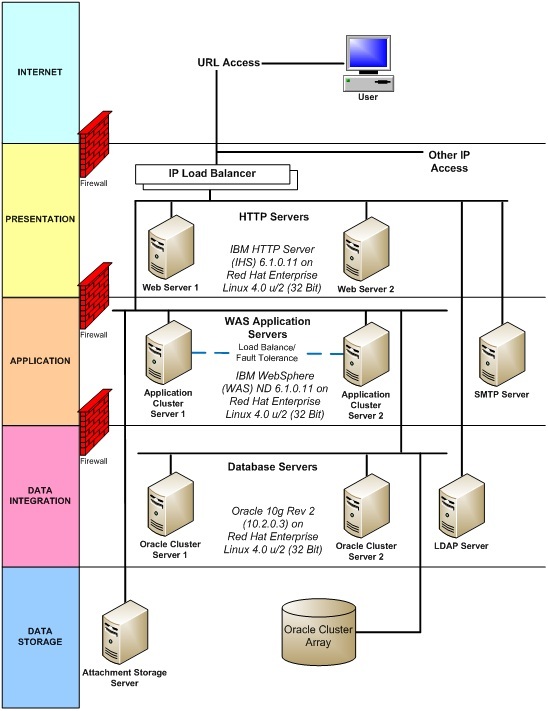 It also helps in providing high availability/load balancing among web application servers when configured. The next layer, application layer, is provided by a J2EE application server which implements application Solution compliant processes, which help update business data for various applications, provide notification, reports and logs as needed. The core Application Web-Tier is the server platform which handles all aspects of all applications – security, data entry, reporting, operations and management. The database layer, data integration layer with the data storage, makes up the third layer which hosts application data in reliable and robust way. Each layer is hosted by a single or set of hardware servers running any of the server operating systems. These servers are connected by IP based LANs. These LANs could be isolated using firewalls if needed.